Even though unemployment rates are lower than they have been in years, companies are still incredibly selective in terms of picking, or even interviewing, business development, capture and proposal talent. It’s a competitive, cut-throat world out there in the government contracting industry and the need for great talent is immense. It’s important to make not just a good first impression, but a lasting one as well. 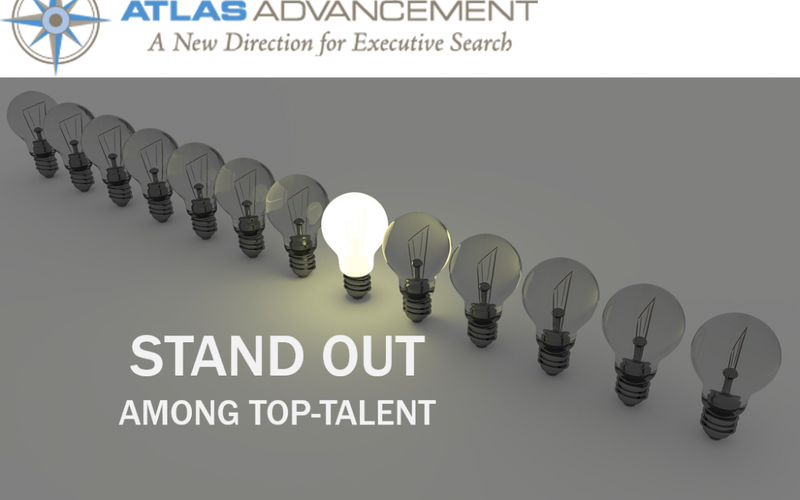 Having started my career in software sales prior to becoming a founding Partner of AtlasAdvancement, Inc., I have more than fifteen years of first-hand knowledge of how vital it is to your career to stand out against other top-talent. This blog is going to outline some important ways in which you outshine your peers and be a candidate that recruiters want to engage with and clients want to interview. It’s imperative to always have some strong details about your career, progression and the ability to demonstrate “why” a hiring manager might think you are an ideal fit for an open role. They value simplicity and resumes that have content that resonates clearly and sensibly. The ability to articulate your background for different searches depending on requirements is vital. One size very definitively does not fit all, and getting noticed has become somewhat of a science. Recruiters and hiring managers look for job tenure, ability to handle complex issues and think on the fly. Clients look for leaders, problem solvers and people who want to thrive to be the best. Problem solving and always having great questions for your recruiter and potential employers is always suggested. Arguably, LinkedIn is just as important as your resume as it’s often one of the first avenues recruiters have at getting insight into who you are professionally. Having a strong LinkedIn Profile and good client references is crucial when building a profile. Showcasing your demonstrated work abilities as a team player and individual contributor is key to a successful career. It may sound mundane, but it’s also a good idea to have a professional picture and image on LinkedIn. Remember that employers always review all different sources of social media and LinkedIn is typically a recruiter’s or hiring manager’s first stop. Make sure to keep your personal profiles marked “private” and void of any content that’s in poor taste. The internet is a fascinating, but scary highway, and once information is out there, it poses the risk of painting a deceptive picture of who you really are. So, assume if you think it may be too risky or pushes the boundaries, keep it classy. Being professional and having business ethics is what people want in this market place. In this industry and market place where consolidation is inevitable – you never know when the same former boss or previous subordinate could be your new Vice President or in a leadership role at your next company. It is critical to never burn a bridge and to always maintain professionalism as it’s commonplace in this industry for paths to cross again. Everyone can claim that they’re a “winner” – but show us the facts. If you are a Director of Business Development – make sure you’re highlighting your sales process or cradle-to-grave understanding of the life-cycle of a deal from inception (cold call, RFP, proof-of-concept) to deal closing. Recruiters, and hiring managers alike, love to see numbers related to any quota carrying or revenue growth roles. What have you done lately and how much true, tangible involvement did you have in winning that $100M government agency deal? Did you stack the 65-page proposal and bind the content, or did you write the true agile sections with the integration solutioning, data modernization and machine learning process sections? Decision-makers want to see results which calls for candidates to back up their profiles with real, tangible work experiences and data points. In closing, enjoy what you do and do it with conviction and passion – it will show through on your resume and speak to who you are professionally. Recruiters and clients can sense peoples positive or negative energy in the very first call with you, often even through just a first glance at your resume. Be proud of your career and your achievements – highlight them and make hiring you as a long-term asset never a question.